EfD researchers have been working with Cape Town’s authorities in their efforts to stave off #DayZero – the day when the Cities taps run dry. Their findings cast new light on the importance of effective demand management to cope with water shortages. In this blog we discuss how the tools of economics can be used to pre-empt such crisis management in growing cities in the Global South. The news that Cape Town’s taps could run dry has made headlines across the world. The worst drought in recorded history coupled with inadequate infrastructural investments and management strategies to cope with the city’s rapidly growing population have come together to create what seems to be the perfect storm. Unfortunately, Cape Town is not alone. Water scarcity is a growing issue for cities around the globe. We believe that economic instruments are an essential part of the solution both in the short- and long-term. In order to avoid disaster, the city has had to drastically reduce its water consumption in a short period of time while intensifying its efforts to secure additional supply. 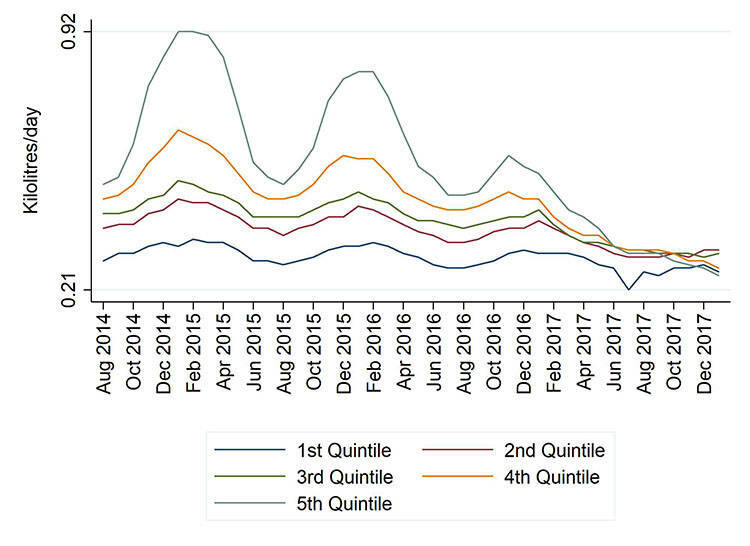 The figure below, taken from Professor Martine Visser and Johanna Brühl’s recent op-ed shows the decline in water use by income quintile that resulted from a coordinated array of policies implemented by Cape Town in the face of the drought. In the last three years, the city has more than halved its water consumption. Across the income distribution household water use has converged to the level of the lowest income groups. Had it not been for this feat in demand management, the city would likely have been without water. In order to accomplish this, the city implemented an array of interventions. Water tariffs have in the last two years increased by at least 400% for all user-groups, and by over 2500% for those that consume the most. Severe physical restrictions were also put in place, directly limiting excessive consumption. These demand management methods were accompanied by an extensive communication campaign across various media platforms to foster public awareness. EfD researcher, Professor Martine Visser and her team at the University of Cape Town have been working closely with Cape Town’s city officials over the last couple of years to develop a response to the crisis. Her work on behavioral nudges to encourage household water saving has fed directly into the city’s own strategies and has shown that the right types of behavioral messages sent to households can be effective in reducing water use. Social recognition of water conservation efforts by households, social comparisons and appeals to the public interest in water conservation was found to be more effective in inducing behavioral change than providing information of the personal financial implications of water savings. The take-home message from Martine’s research in Cape Town is that behavioral nudges can be an effective strategy to reduce water use rapidly in times of crisis, and that nudges can be integrated with traditional demand side management strategies. In the long term, getting water pricing right is essential to effectively manage demand. The UN predicts that an additional 2.5 billion people will live in cities by 2050, with nearly 90 percent of this increase concentrated in Asia and Africa. Africa’s urban population alone is expected to increase by two thirds in the next 35 years. Urban economic and population growth and poor pricing policies are driving growing water scarcity. In addition, climate science predictions show that weather patterns will become more erratic in the future. Water utilities need to carefully plan now for the possibility of future water supply shortages. Climate change predictions need to factor into the way public water utilities make decisions. As reforms are introduced, however, utilities need to understand how tariffs will affect water use in the short- and the long-term, revenues, and the resulting needs for infrastructural investments. Water professionals must design a mix of policies to meet equity, economic efficiency and cost recovery objectives to address this complex, dynamic policy problem. Success will require both technical expertise and political leadership. At present, Increasing Block Tariffs (IBTs) are the most widely used instruments for municipal water use pricing. IBTs are structured in such a way that the marginal price for water use that customers face increases step-wise with increased consumption. The ambition with IBT is to cross-subsidize the water use of poor households that are assumed not to use a lot of water, by charging rich households (who are assumed to use more water) more than the total average cost. However, IBTs do not target the subsidies provided by municipal water utilities effectively. In a study of the incidence of IBT subsidies in Nairobi, Kenya, EfD researcher David Fuente and his colleagues found that richer households were disproportionately favoured: the richest 20% of households connected to the piped water supply network ended up receiving more subsidies than the poorest 20% that were connected. Even worse, many low-income households were not connected to the piped water network at all, and, thus, did not receive subsidies delivered through the water tariff. The key point is that while they have been widely implemented, IBTs are both inefficient and unfair. Water utility managers and the public need to adopt an “evidence-based” approach to tariff design. Instead of IBTs, most water utilities will need a two-part tariff with a fixed charge and a single volumetric rate to customers that impose the same marginal cost of service on the utility. The volumetric rate should be used to send customers a signal about the scarcity value of water and the marginal cost of service. The fixed charge should then be adjusted to achieve financial cost recovery and cost of service equity. Many water utilities will also find it useful to adopt seasonal tariff designs. Social justice demands that poor households should be able to have affordable, potable water supplies. Policy-makers have three main policy instruments to deploy to achieve this objective. First, they can use means-tested CAPs to target subsidies to poor households. Second, policy-makers can subsidize the connections of poor households to ensure that they have access to affordable, potable water services. Third, policy-makers can provide free or subsidized water from public taps as a safety net for poor households. The appropriate policy mix for these three pro-poor instruments will depend on local conditions. Economic tools to manage demand and allocate water resources equitably and efficiently are of key importance to policy makers going into the future. Too many existing strategies rely too heavily on expensive and at times ineffective infrastructural investments while not paying sufficient attention to long-term strategies to encourage households and businesses to conserve water. Economic instruments could give households and businesses the signal to invest in preparation for future water scarcity already now, so that they don’t have to incur the expensive adaptation that the people of Cape Town recently did under the threat of Day Zero.